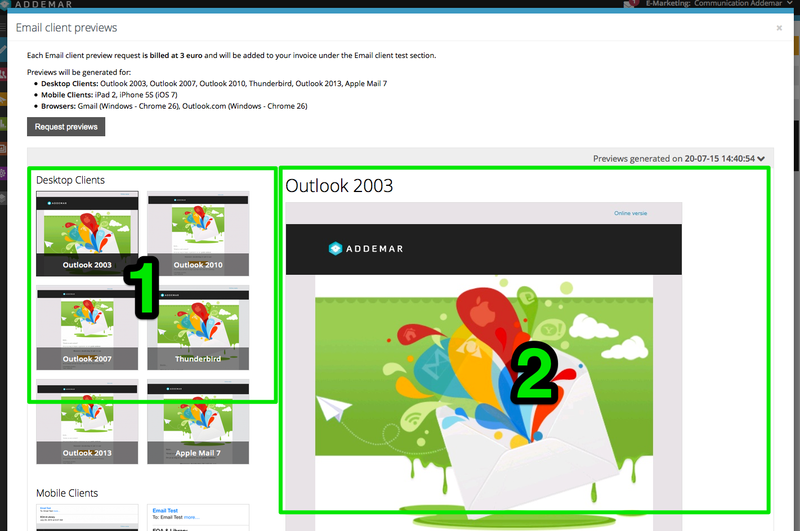 Addemar Support Knowledge - Have you ever faced problems with how your email was delivered in different emails clients? Can I see how my email is delivered and shown in the different email clients, inboxes? Can I crosscheck how the email is delivered on mobile devices? In our platform we have made it possible to see how your email creation is being shown to your contacts. We have integrated the well-known Email on Acid functionality into our platform. How do you request these previews? Open up any creation, you'll notice a new action icon in the top bar. When you click "Email client previews" a new popup opens with the following details. We will provide screenshots of your creation for the following email clients, mobile devices and browsers. To request these previews click the "Request previews" button in the popup. The result of your request ! Once you have finished your request, our application will notify you via our notes system when the requested screenshots / previews are ready for you ! It takes no longer than a couple of minutes to obtain the result. To view these screenshots, click the link in the notes you received. Both actions open the same result popup as shown below. ( 2 ) At the right side of the popup you see the full preview of the selected email client, mobile device or browser. You can simply click on the thumbnail to get the full preview in the right side of the popup. Or you can use the arrow keys of your keyboard to toggle between the results. The feature needs to be activated first in order to use it. Your account manager or our support can activate this feature for you ! Please be aware that each requested tested in billed and will be added to your monthly overview.